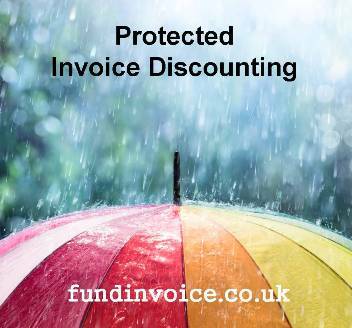 Protected invoice discounting (PID), is where the discounter includes bad debt protection (also known as non recourse), in addition to the provision of funding against your unpaid sales invoices. This is still a confidential invoice financing product, but with the addition of debtor protection to protect against bad debts. We looked specifically at how the cost of that added protection compared with the standard pricing i.e. without bad debt protection (often called "recourse" or "with recourse"). In all cases, the admin charge was quoted as a percentage of the value of turnover discounted, and the debtor protection premium was quoted as an additional percentage of that turnover, specifically allocated for this added extra. Discount charge and any minimum fees were ignored for the purpose of making this comparison. Using the example of an average sized prospect that we sought quotes for, we were able to compare the additional premium quoted for debtor protection against the quotes received without. It should be noted that in a handful of cases the discounter was actually prepared to reduce the administration charge if the customer took up the protected option. We have accounted for that reduction in our analysis. Administration charge (or fee) is often, incorrectly referred to as "service charge" (or fee) in the context of invoice discounting. One of the key issues is that the lack of provision of any service in the case of discounting, unlike factoring where the client receives credit control, affects the need to charge VAT on the fee. We found a large range in the percentage added on for the debtor protection (net of any reduction in the underlying admin fee for taking up the non recourse option). The additional debtor protection premium ranged from between 20% of the the admin fee for a recourse facility, and 150% of that charge. A very wide difference between the quotes that we received. The average increase was 63% of the quote for the recourse only option. We also compared the administration fee prices overall and there was a significant range in the overall cost to our client. The most expensive overall administration fee was twice as much as the cheapest quote for protected invoice discounting that we received for our client. Bear in mind that all the quotes were to provide broadly similar facilities to the same client. This means that if you choose the wrong provider, you could end up paying twice as much admin charge as you needed too have paid, had you selected an alternative provider for PID. This is the kind of research that we use to enable us to find the best providers for our clients, helping them to avoid paying too much.